I've been asked fairly frequently for links to other teenage and grown unschoolers blogs, so I decided to put a bunch of links together in one post! I try to keep this list updated with current blogs, so I add new ones as I discover them and remove blogs that are no longer active. Eli Gerzon's Worldschooler Blog Eli is a grown unschooler from Boston who blogs about unschooling, worldschooling, and travel, as well as leading Worldschool Travel Tours. Follow That Dream is a blog by Elisha, a grown unschooler who blogs about a variety of subjects, including unschooling. The Organic Sister is a blog on natural living and unschooling by Tara, a grown unschooler who's now unschooling her own son! College Rebellion is a website and blog by Jessica, a grown unschooler, who writes about uncolleging, travel, goal setting, finding employment, and similar interesting things. Brighter Than a Buoy is a blog by grown unschooler and terrific songwriter Carsie Blanton. If you're a teenage or grown unschooler who has a blog, or if you know of a teenage or grown unschooler who has one, just let me know and I'll add it to the list! Like you said: if anyone has any websites (including bands on MySpace, graphic or web designers, photographers, etc) by grown unschoolers let me know and I'll add to that list too. A couple of these blogs I haven't heard of and wanna check out. And I took a look awhile ago at Adversarian but didn't know she was from Finland and want to read more: seems to have interesting ideas. @Eli: Thanks! :-) I changed the link. The only reason I used the old link is because I couldn't find the new one on your blog! Something weird happened when I went to look at older posts... Don't know if it was a problem with your site or my comp! I'm so happy to find your blog, which has one of the best titles ever. I'm a grown unschooler, too. @Eli: Not sure... But I just went and tried to go to older entries now, and it worked perfectly! @Netzi & Andrea: :-) Glad you like the links! @Coleen: Thanks, I'm really glad you like it! You're a grown unschooler? Awesome! Would you like/mind if I added your blog to the list...? Don't forget me! I was unschooled thru high school. My unschooled 13 year old has a blog, mostly about knitting, which is her current passion. Left school in February and getting more unschool-ish as the months go. Most entries are mundane but starting to touch on beliefs and lifestyles. How can it not be humble when the account is two months old? I've started blogging out of boredom at http://towanderwithoutbeinglost.blogspot.com/. I suppose that's relevant considering I'm an unschooler and will probably talk a lot about unschooling life. Ooops--maybe I didn't see that you had Olivia's blog listed? Or perhaps you just added it? Either way, thanks for including it in your list! I look forward to reading the other blogs, too! Hooray! A list! 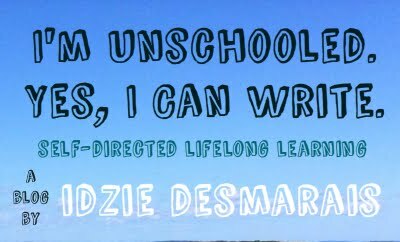 I've been looking for more unschooling blogs to follow.